Carla is kind, funny and possesses a wonderful soul that brightens the lives of everyone she comes into contact with. She is an amazing mother, wife and friend. Carla has been in the hospital for over a month battling complications from the flu. She is looking at an extended recovery. Her friends at work would like to extend the ability for people to help ease the financial burdens on the family as extended hospital stays can be overwhelming. 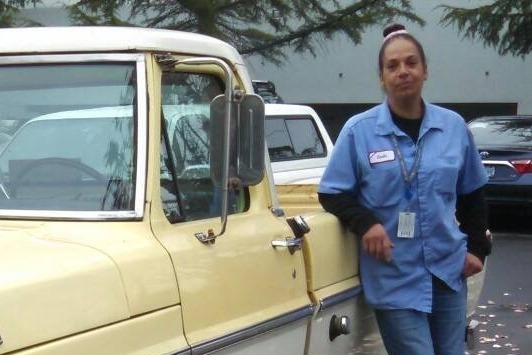 She has been with Tri-Met for 8 years and is currently working as a light rail technician. Her co-workers miss her dearly and are praying she will recover soon. The proceeds will be directed to Carla's husband of 27 years Wayne Smith. This is a link to Carlas facebook page, please stop by and wish her well. It is with a heavy heart that I share this news with all of you. Sunday night Carla's husband Wayne, decided to have Carla removed from life support. Her beautiful soul will be greatly missed by all. I will continue with this campaign, with the donations going to Carla's Family and funeral expenses. I thank all of you for your kindness and generosity. I spoke with Carla's husband Wayne yesterday to get an update on Carla's condition. Her liver is responding to treatment, which is good news. The bad news is her lungs are not responding and she is still on a ventilator. She can't be on the ventilator too much longer or it will start to cause damage to her throat area. We are all praying her lungs start to respond to treatment very soon or some more drastic action will need to be taken. We have raised additional cash donations at both shops. That money will be delivered to the family this week. We will continue to collect donations via Go Fund Me until Carla can get out of the hospital and hopefully return to work. Carla's fever has broken and now we are all hopeful the rest of her organs can begin to heal. You are all wonderful friends of Carla.